Why Join the North Carolina Head Start Association? I Am Head Start | Keith McCorkle from New Frame Videos on Vimeo. North Carolina Head Start Association (NCHSA) advocates on the state and federal levels in support of early childhood and social issues that directly affect Head Start children, families and programs. Representatives of NCHSA participate on state level advisory boards, visit offices of elected officials to educate our lawmakers and represent North Carolina at Regional and National Head Start Association meetings. NCHSA organizes and assists with several professional development events throughout the year, such as the Annual Training Conference, New Directors Orientation, Director’s Caucus meetings and special Cluster training events, that enable directors, staff, parents and community partners to interact and learn. Child Care Contact Hour Credits and College CEU’s are often available to participants. Members enjoy the opportunity to network at collaborative events held in partnership with the NC Community Action Association, Child Care Services Association, Region IV Head Start Association, National Head Start Association, NC Office of School Readiness, NC Division of Child Development, NC Partnership for Children, NC Department of Health and Human Services, and other social service and early childhood organizations. NCHSA maintains program contact information for every Head Start program in North Carolina. 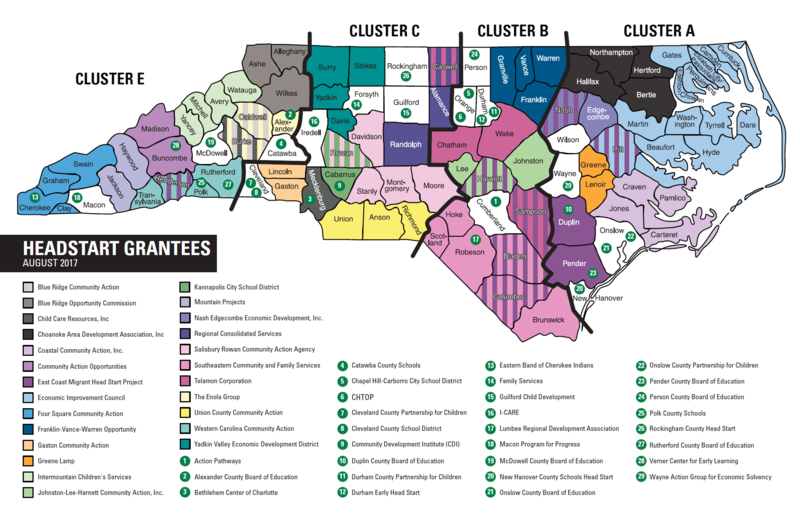 We are building our capacity to serve as a one-stop resource both for NC Head Start programs and for parents, community partners, collaborative partners, elected officials and anyone with an interest in Head Start. NCHSA acts on behalf of Head Start programs across the state, acting as a catalyst for change in support of children, families and programs. NCHSA is the ONLY state organization dedicated exclusively to the concerns of the Head Start community. As such, NCHSA supports members in researching issues and questions, and provides referrals and information as appropriate.